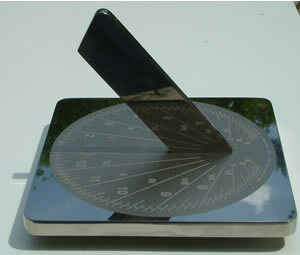 The sundial measures 15 x 15 x 11 cm. high, and weighs 1.75 kg. It can be attached to a plinth or any other horizontal service using the four blind M6 threaded holes at 10 cm. centres on the underside. If it is to be used freestanding, for example, on a windowsill, four self-adhesive feet are supplied to give a 9 mm. spacing between the surface and the sundial. 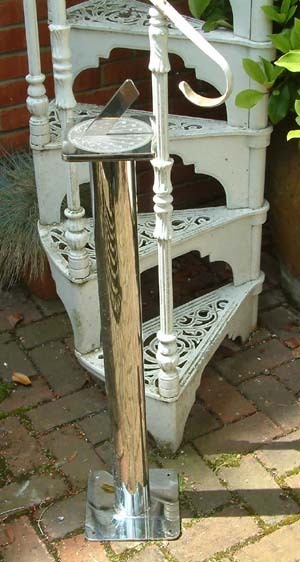 This sundial features the split gnomon which is the distinctive innovation of all sundials in the Spot-On family. It can be set up accurately to true North, following the procedure on our setup page. The price of the 15 cm. 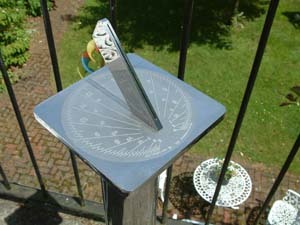 Spot-On Sundial in stainless steel is £150 + £10 packing and delivery.